The other day, I stumbled upon one of the most unusual music collaborations I've ever seen or heard. There a scene in Hal Ashby's brilliant but underrated film Being There (starring Peter Sellers) that features the animated music video (if I can call it that) for Cheech and Chong's "Basketball Jones" from their 1973 Los Cochinos album. Riding the wave of the 70's blaxploitation movement, the parody* features Cheech on vocals as "Tyrone Shoelaces" and get this, George Harrison on lead guitar, Billy Preston on organ, Klaus Voorman on bass, Ronnie Spector and Michelle Phillips on backing vocals, Carole King on keys, and a slew of several other well-connected and accomplished session players. Are you kidding me?!? How did I not know about this?!? Take a listen. If you can get past the politically incorrect images, the underlying music is actually pretty freaking good! Do you ever find yourself going back to the same album or song on your iPod on a seemingly regular basis? You know, those that aren't necessarily your favorites, but ones that you're mysteriously drawn to as if satisfying some primal urge? On my walk to work today, it occurred to me that for the past year, I've listened to one particular album ad infinitum -- on the sidewalks, on the subways, on the bus, at my apartment, etc. It isn't my "favorite" album nor do I have any special connection with it on some personal or spiritual level. And I assure you, it has nothing to do with iPod's pointless "rating" feature we accidentally click on from time to time! 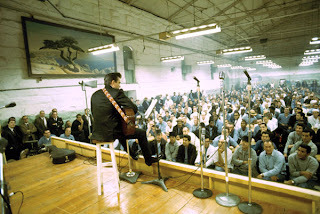 But for whatever reason, Johnny Cash's At Folsom Prison/At San Quentin/America is the undisputed, most frequently played recording on my iPod. Why? I have no answer. Obviously, this is a great album. Hell, it's even one of the best. No one (with any concept of good music) would disagree that it ranks amongst the most influential from a historical/cultural perspective over the last 50 years. But there is something more -- something more deep-rooted that reels me in each time. Perhaps I'm hypnotized by Cash's raw, monotone vocals or the everyman's wisdom he so aptly instills; or maybe I'm moved by the hoots and hollers of the prison inmates, who were undoubtedly the most affected by these performances on the most human of levels -- at least more so than any of us; or the fact that Cash put every ounce of sweat and soul into each song that keeps me truckin' on both good days and bad. Even his narration on the America album has a certain soothing, nostalgic quality which brings me back to the storytelling days of my youth -- a better, much simpler time. So, hats off to you Johnny Cash. You're the most popular guy in class. Not...Done...Yet. While it may be clear that this blog is on its last legs with the obvious lack of posting of late, the reason for its initial existence has not faded. It's to share stories, articles, news clippings, and videos that inspire three guys to pause their day for a few moments and reach out to whomever is paying attention. And that's where I am at right now. Maybe I'm just being nostalgic, but this concept that you have a strong urge to write your thoughts on a piece of paper and lick a stamp and put it in the mail, knowing full well the intended recipient may never receive it or worse they could blow you off, is fascinating and reminds me so much of what life was like without the WWW. Her feeling a need to connect to John Hughes is no different than a blog poster or commenter writing an entry never knowing if anyone will care. It's the writing part that is cathartic. Any feedback or acknowledgment thereafter is just gravy. 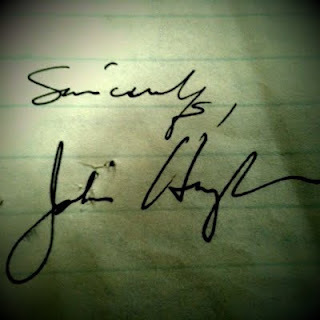 Getting back to our John Hughes fan, their (not e-) mail relationship blossomed, they became heavy pen pals, and the reclusive John Hughes let her into his world. Please take a minute to read through the whole entry she wrote. It is fascinating, and of course all too sad knowing that John is no longer with us. John ruminates on a number of things and provides unprecedented insight into why he left Hollywood for good so many years ago. And if you want to take a chance and leave a comment, whether to connect or leave your thoughts, feel free. No stamps required.